The commemorative RMS Titanic Brass Compass is truly a great gift to any nautical enthusiast in your life. This 4-inch in diameter compass features a solid brass body and face with a gorgeous finish. 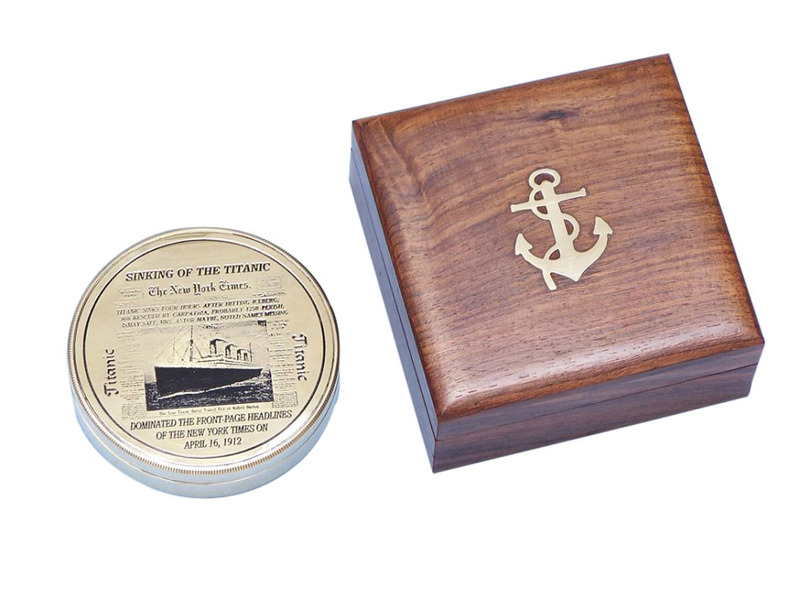 Inside the top lid shows an etched image of the famous shipwreck with a few sentences commemorating the sinking of the RMS Titanic. This compass also has a sundial compass heading and is a great instrument for any nautical explorer. The compass rose is graduated in degrees and has a standard surveyor's 0 - 90 degree scale from North and South. This antique nautical compass depicts one of the most famous, and infamous, ships in the history of sailing. Beginning construction in 1909, and intended to radiate grandeur as one of the most luxurious ships every launched, the RMS Titanic instead left a much darker legacy. Shown on the solid brass compass cover the Titanic’s sinking was a tragic end to a ship that was deemed unsinkable, making headlines across the globe. The Olympic-class vessel, constructed in Belfast, began its maiden voyage from Southampton, England, to New York City on April 10, 1912. Departing to great fanfare and celebration, the largest passenger ship in the world headed out into the deep Atlantic to meet its fate. Inscribed on this nautical compass is a tragedy that left 1,517 passengers dead in one of the worst maritime disasters in history. Though the ship suffered a horrific end, its start was dazzlingly bright. At just over 882 feet long, with some of the most advanced technology of the time incorporated, the Titanic was a floating palace and playground to some of the wealthiest and most prominent people of the time. Featuring a luxurious design in the cabins, with rich woods, polished brass, and crystal throughout, the Titanic was truly a magnificent sight to behold. Aboard ship were the hallmarks of what became the luxury cruise lines we know today. Featuring a pool, gym, squash court, hammams, and fine dining restaurants, the ship was ahead of its time. For the passengers aboard the ride would be the most spectacular in history, until the fateful day of April 15. On that day, with the unfortunate combination of deadly waters and human error, the Titanic struck an iceberg, sheering the starboard side and causing the ship’s compartments to begin filling with icy water. Shown on this nautical compass the iceberg sits silently behind the ship, as she sinks into the Atlantic, and as passengers hurry to escape in lifeboats. In another twist of fate the Titanic only carried enough lifeboats for a third of the passengers, a decision that would doom many to the depths of the ocean. With no other ships near enough to attempt a rescue, and as the Titanic sank quickly in the cold night, the passengers who were lucky enough to make it to a lifeboat were spared and spent the next couple hours waiting and praying as the RMS Carpathia sailed to their aid. Three days later the Carpathia docked in New York, the survivors of the tragedy finally ashore, and the brief life of the Titanic had come to a close. 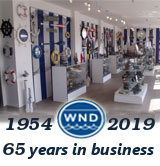 Wear this nautical compass as a reminder of the importance of life, let it guide you safely to your port of harbor, and let the history of the Titanic continue on.